Saddlebred head earrings, five gaited with ribbons. Saddlebred five gaited riders attention! Now you can enjoy a design all for you. Offering fabulous two dimension and great Saddlebred distinction. 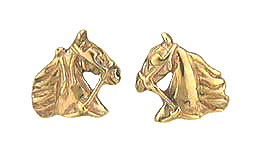 Which definetly gives the earrings The Gorgeous Horse touch you can only find here.